Growing up on a farm in Nebraska, I spent most summer afternoons outside, exploring, digging, and collecting “treasures”—usually rocks, feathers, bugs, and other lovely items I’m sure my mother was thrilled to have me drag into the house. These days, I’m mostly desk bound, and I don’t get my hands dirty nearly as often as I’d like. But recently, I got to channel my inner 5-year-old, leaving the computer screen behind to play with some wiggly, slimy worms! 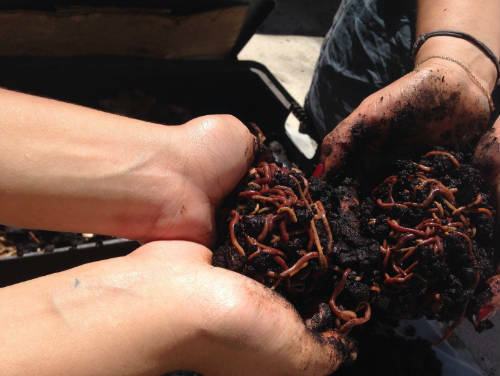 For the law few years, NRDC’s Santa Monica office has composted the majority of our food waste using a rooftop worm bin. Every so often, the compost must be “harvested” by plucking the worms from the finished compost and returning them to the bin where they can continue to work away. Once it airs out, the worm-free finished compost assists my colleagues and me in our amateur gardening pursuits—in addition to giving me a reprieve from my desk for an afternoon. On a larger scale, compost can be a key tool to improve the health, resiliency, and productivity of agricultural systems. A recent USDA webinar highlighted research conducted in Maine comparing five different potato cropping systems. Take a look at the green line in each of these graphs. It represents the “soil improving” rotation in the experiment. The “soil improving” system utilized compost and a barley cover crop. Under rainfed (non-irrigated) conditions, the soil improving rotation had notably more productive potato plants than any of the other cropping systems. And in fact, the rainfed yields in the soil improving system were on par with the irrigated yields for all the other systems. In other words, improving soil health can be as effecitve as irrigation at increasing yields. That’s a significant finding because not only is irrigation expensive and time consuming for farmers, but water availability is increasingly becoming a limiting factor for many farmers across the country. The study repeated for two more years and found similar results—each year, the soil improving system was as effective as irrigation at increasing productivity. These remarkable results align with compost research in other parts of the country, showing that compost increases soil’s water holding capacity and increases productivity and resiliency. Now, of course not everyone has access to a financially tenable source of compost, especially on a large scale. But there are other ways to improve soil health and productivity and increase resiliency to hot, dry weather. For example, take a look at the 2-year results of a Midwest cover crop survey conducted by USDA’s Sustainable Agriculture Research and Education branch. The 2012 yields are especially telling here. You’ll recall that 2012 hit the Midwest with the worst drought in decades, causing billions of dollars of crop loss. Yet the yield benefit from cover crops was most pronounced in areas that were hardest hit by the drought—a testament to healthy soil’s ability to store water for when growing crops need it most. And even here in California, a relatively irrigation-dependent state, healthy soil can help farmers weather dry times. A recent Grist article pointed out that in California, no-till and residue management reduces irrigation water requirements by 16%. So the moral of the story? Don’t be afraid to get your hands dirty! Whether it’s in a window box “garden” like mine, or on a large scale farm, improving soil health through compost, cover crops and other conservation methods is fun and rewarding! 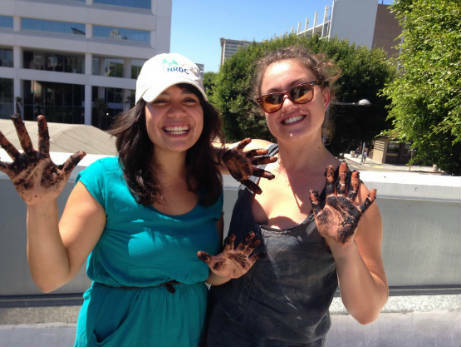 Photo: NRDC Santa Monica Staff Aline Goganian and Julie Mendel show off their dirty hands after harvesting compost!